For document recovery and photo restoration, you can count on Bill Floyd Photography's expertise. Bill Floyd offers various archival methods through digital photography software. 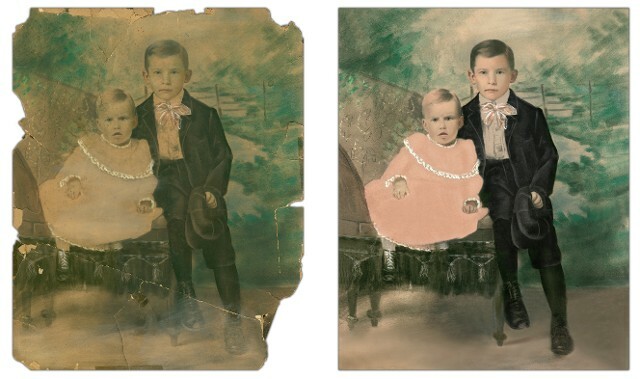 There's still hope for photos and documents damaged by accidents or environmental factors. Contact Bill so he can start digitally repairing your treasured images and records. Since 1998, Bill Floyd Photography has been an industry leader in photo restoration. Digital photography specialist Bill Floyd serves customers in Evanston, Illinois, and the surrounding areas. Using the advanced editing software, Adobe Photoshop™, he scans and fixes photos that are damaged, torn, or ruined. He also specializes in restoring and preserving old and faded documents. All retouching is done on the digital file, which when completed, can be printed or stored on CD. back to their former glory with his digital photography and photo restoration skills.